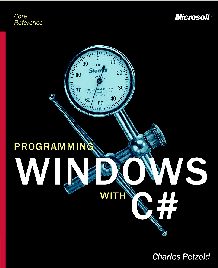 I've just received a letter from Microsoft Press informing me that the print edition of my first .NET Windows Forms book, Programming Microsoft Windows with C# has been declared out of print. Based on dwindling demand for this book, no more copies will be printed. Normally when a book goes out of print, the rights revert back to the author, which means the author can take the book to another publisher, or even publish it on his web site. However, Microsoft Press is still apparently publishing an electronic version of this book, so they retain exclusive publication rights. For me, writing a book like this requires about a year of full-time work. The contract is dated November 1, 2000 (although I remember starting the book before the contract was signed) and I finished the following November. So this is the book that dominated my life in 2001, and looking through its pages I can remember many months of pleasure, particularly working on the graphics chapters. It's sad to see the book disappear from the marketplace.